For some reason divers have a hard time telling these two fishes apart. Stonefishes although closely related to scorpionfishes differ by lacking scales. 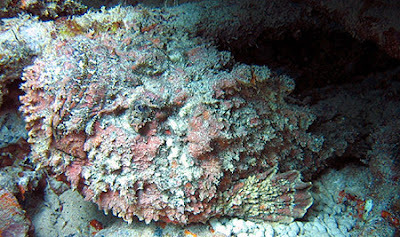 Stonefish are extremely cryptic with large head with upturned eyes and mouth, fringed lips, tiny eyes, and leathery skin with wartlike projections and short tassles. This hideous creature is probably the world's most venomous fish. Beneath its skin are grooved spines along its back, each with a large venom sack at its base. The stonefish has been responsible for numerous debilitating and occasionally fatal injuries. The wounds are extremely painful and may result in death of the surrounding tissues or loss of the wounded fingers or toes. Most scorpionfishes aren't quite as cryptic as the stonefish. Pictured below is one of the more common scorpionfishes in the CNMI, the Spinycrown Scorpionfish. Venemous fish are rarely aggressive and usually contact is made by accidentally stepping on or handling the fish. Venom is generally heat-labile and may be decomposed by hot water. Antivenim is available for stonefish and scorpionfish stings. 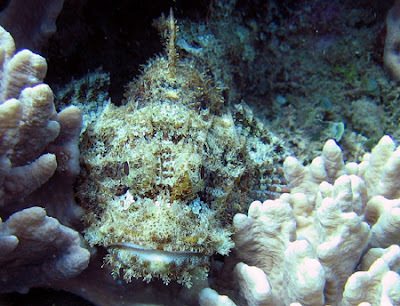 The anti venom is specific for the stonefish but may have some beneficial effects against the scorpionfish. Local symptoms following a sting include severe pain which may persist for many days. Generalized symptoms are often present and may include respiratory failure and cardiovascular collapse. 1. Get victim out of the water; watch for fainting. 2. Lay patient down and reassure. 3. Observe patient carefully for the possible development of life threatening complications. The venom is an unstable protein which acts as a myotoxin on skeletal, involuntary, and cardiac muscle. This may result in muscular paralysis, respiratory depression, peripheral vasodilation, shock, cardiac dysrhytmias, or cardiac arrest. 4. Wash the wound with cold salt water. Suction is not effective to remove toxin. 5. Soak wound in hot water for 30 to 90 minutes. Heat may break down the venom. The water should be as hot as the victim can tolerate. Adding magnesium sulfate (epsom salts) to the water offers no benefit. 6. If anti venom is used, the directions on the package should be followed and the physician must be ready to treat for anaphylactic shock (severe allergic reaction). If you are still in agony after following steps 1 through 5 of Richard's treatment protocol, rest assured that Commonwealth Health Center stocks Stonefish Antivenom. Make sure you bring your checkbook as the drug cost alone for a one or two spine puncture treatment is around $300, three or four spines will run you $600, and greater than four spines will set you back $900 (again, drug cost only). Maybe this is a deal as I checked with "Cairns Base Public Hospital" in Queensland and their prices were approximately twice CHC's (in US$). **Trivia Time: Stonefish Antivenom is the only non-US FDA approved drug on CHC's formulary. **Trivia Time II: The source of Stonefish Antivenom is horse serum. Basically, some lucky Australian horses are injected with the venom ; the serum is collected (antibodies and all), purified, packaged, and shipped to an ER near you.